Multimillion dollar turkey marketing effort includes TV ads, social media and internet elements. The Honeysuckle White and Shady Brook Farms turkey brands announced the launch of a multichannel marketing campaign encouraging consumers to “keep giving thanks” to farmers who produce the turkey protein we eat. The multimillion-dollar campaign includes a 30-second television ad featuring a Missouri turkey farmer on one of the 700 farms where birds are raised for both brands. The campaign will run Jan. 25 to April 4 in key markets. TV ads will air on the ABC, CBS, FOX and NBC networks and are designed to reach all consumers, especially those in three core turkey consumer groups identified through 2014 research conducted by Honeysuckle White and Shady Brook Farms. 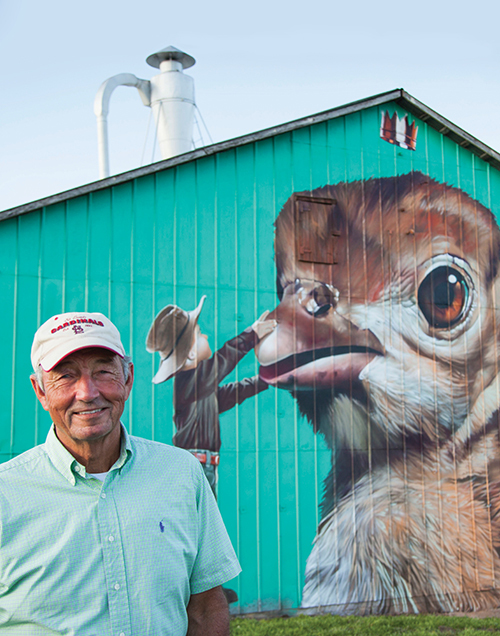 Cargill independent turkey farmer Glenn Robertson and his Missouri barn. In addition, the campaign will expand its overall reach with a market-specific, geographically targeted focus using “Connected TV” (television with internet), including Hulu Plus, Netflix and HBO GO. An extended (90-second) video version of the TV ads will be available via social media channels, including Facebook. The ad will also highlight that Honeysuckle White and Shady Brook Farms turkeys are raised without the use of antibiotics for growth promotion purposes. Cargill provides food, agriculture, financial and industrial products and services to the world. It has 150,000 employees in 70 countries.